So simple to cook up with very easy prep; you can have this nutty, bright, one-pot-wonder on your table in a little over half an hour. Try the recipe exactly as it is here with carrots, green peas, coriander, fennel seeds, fresh thyme and a pinch of cloves or go ahead and let your tastebuds lead the way! 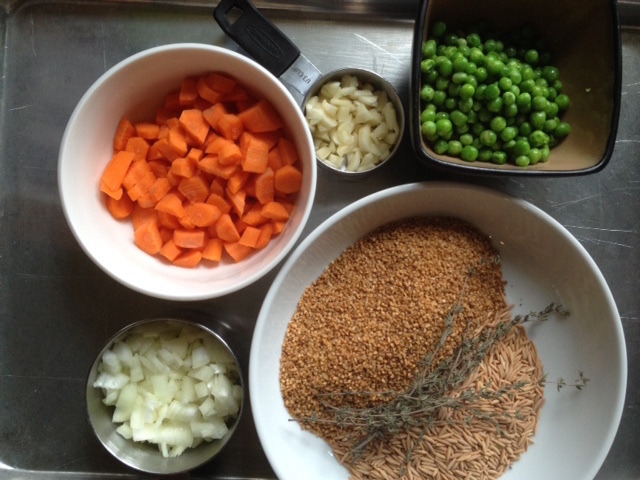 Carrots and peas (listed below) are probably the most often used bulgur pilaf mix-ins and, truth be told, these standards are positively wonderful. 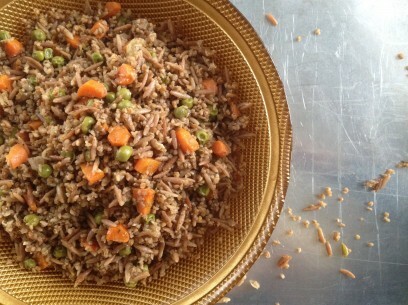 They both add a delicate sweetness to the nuttiness of the bulgur and balance the heartiness of this dish well. especially in the summer, a picnic pilaf with dried apricots, pomegranate seeds and toasted pine nuts – just fantastic, I promise you! As you can see, you can really make this dish your own which, for me, is a big part of what makes it so special! use 1 cup uncooked bulgur to 1 1/2 cups water and equal parts uncooked orzo to water. Toast orzo and bulgar (separately) over VERY low heat until they begin to just slightly brown. Set aside. Grind coriander and fennel seeds together in spice grinder or mortar and pestle. Set aside. Add olive oil to 3 quart saucepan (one with a tight fitting lid) and sauté onions until almost translucent. Add garlic and sauté until tender, careful not to burn! Add toasted orzo and bulgur and mix well to coat with olive oil. Add carrots, peas and spices. Mix well to combine completely. Add water and sprigs of thyme. Stir gently to combine all ingredients and bring up to a boil. Lower heat to low simmer, cover and cook for 20 minutes. Without removing lid, take pilaf off of the heat and let sit, covered, for an additional 10 minutes. Then fluff the pilaf with a fork, being sure to remove all thyme stems, and gently stir in lemon zest and fresh mint. Garnish with chopped walnuts. Enjoy right from the stove or at room temperature. Bulgur pilaf keeps, covered in the fridge, for up to a week. We loved this! I grated the carrot and added some finely chopped cabbage too as well as extra olive oil after it had cooked. The next day I had it with soya sauce, delicious! !